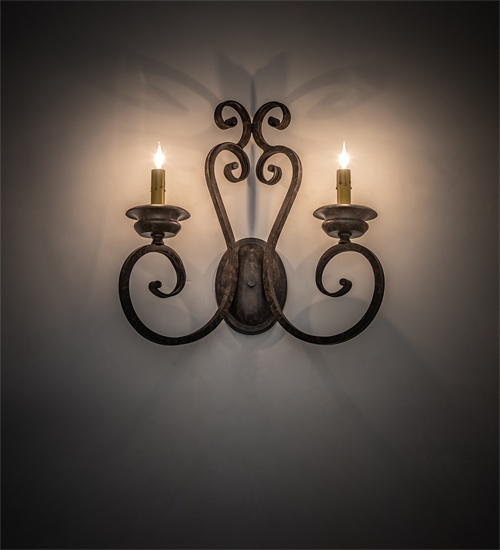 Description: Beauty and grace come to light with this elegant wall sconce. The luminaire is highlighted with an exquisite scroll design. 2 Ivory faux candlelights are perched on distinctive bobeches featured in a Coffee Bean finish. Perfect to illuminate fine homes, hotels, restaurants and other residential and commercial spaces. This classic lighting fixture complements any interior design. Handcrafted by highly skilled artisans in our 180,000 square foot manufacturing facility in Yorkville, New York. Custom colors, styles and sizes are available. UL and cUL listed for damp and dry locations.